On Friday night in Monaco, Ethiopia’s Genzebe Dibaba ran 1500 meters in 3:50.07, toppling the former world record of 3:50.46, set two decades ago in 1993 by China’s Yunxia Qu. It was a spectacular race and a massive improvement from her personal best time of 3:54.11, set just over a week earlier. In addition to Dibaba’s world record, five other women ran sub-4:00, with Sifan Hassan setting a Dutch national record in second, and Shannon Rowbury setting an American record in third, a second ahead of Jenny Simpson. Rowbury’s time of 3:56.29 retired Mary Slaney’s former record of 3:57.12, which had stood for 32 years. * Six of the top 15 times on the all-time list were run in the same race in Shanghai. You can count me among the idiots, because I am overjoyed to see Dibaba finally relegate Yunxia Qu’s 1993 time to second on the all-time list. I have absolutely no doubt that Qu and the other Chinese women who trained under the notorious coach Ma Junren were competing with illegal help. That they were never caught is an embarrassment, and I consider it a blight on the IAAF’s record book that those times continue to dominate the middle-distance lists, just as East German times from the 1980s dominate the sprint lists. Look at that list again: Until Dibaba turned her attention to the 1500 this summer, no woman had managed to come within five seconds of the record or break into the top ten in the last 18 years. Other than the Chinese runners in 1993 and 1997, the only other runners on the list are Tatyana Kazankina, Paula Ivan, and Olga Dvirna. Kazankina, a multiple Olympic gold medalist, had her running career came to a sudden end in 1984 when she refused to submit to drug testing after winning a race in Paris. As for the Chinese runners, almost all of the top times were run in one of two races, Chinese national Games held in Beijing and Shanghai, respectively, where drug testing was carried out by a Chinese lab. Within a couple of years of that improbable race in 1997, Ma Junren’s athletes were testing positive for banned substances, and the Chinese women never came close to replicating their success from the mid-nineties. Revisiting those Chinese records and digging up old articles from that era still makes me deeply uncomfortable. It’s surprising how many knowledgeable people were unable to reach the conclusion that the Chinese were cheating. In the absence of positive tests, coaches struggled to explain how the athletes were able to achieve such performances. There was much speculation that Coach Ma’s methods might be harsh (he reportedly had his athletes running a marathon’s distance every day), but that his results validated his approach. Others sought to explain the performances by invoking cultural differences between the West and the East, to the effect that the Chinese athletes — described as young peasant girls — were willing to endure training that would be unthinkable and unacceptable in the West. Meanwhile, Coach Ma explained it as a combination of hard work, strict discipline, and a diet that included turtle soup and a special caterpillar fungus said to improve energy and endurance. No doubt hard work and discipline played a role, but — I’m sorry — I don’t believe that hard work alone explains such a discontinuous, unrepeatable, quantum leap in times, followed by stagnation and regression. 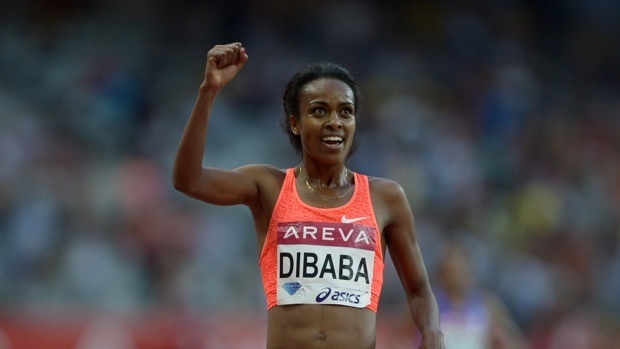 It’s a sad fact that these days every great performance becomes the object of suspicion, and so people will suspect Dibaba (or Rowbury) and their achievements. But I refuse to go that route. I continue to assume that runners are innocent until proven guilty, either by positive tests or by strong circumstantial evidence of wrongdoing. That’s why I cheered when the old record went down. And I hope that if it takes twenty years for someone to run faster than 3:50.07, or another thirty years for an American to run faster than 3:56.29, I’ll still be able to remember and celebrate those marks. This entry was posted in PEDs and Drug Cheating, Pro Runners, Records & Statistics and tagged 1500m, Genzebe Dibaba, Shannon Rowbury. Bookmark the permalink.